5 Best Armitron Watches Review – Are They A Good Brand? Hello everyone, today we’re taking a brief look at Armitron watches, a popular brand in the US that’s starting to get a bit more traction here in the UK. 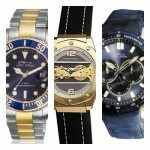 They mainly focus on affordable timepieces and have a huge range of styles and designs available. Personally, they remind me of Akribos watches which you may have also heard of. 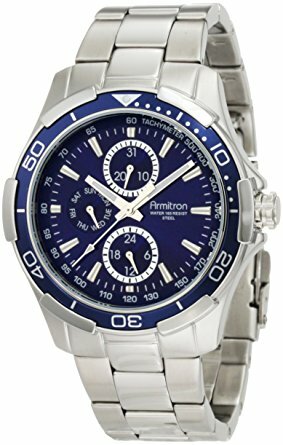 So are Armitron watches actually any good? That’s what a lot of people really want to know. Armitron are a US watch brand that was founded in 1956 by Eugen Gluck. Whilst they are better known in the US market they are now starting to become known in the UK watch market. Head here to learn about the history of Armitron watches. Armitron builds watches for the mass market aiming to have a huge selection of affordable watches available in a range of styles and designs. Sure, you aren’t going to find affordable Swiss watches here, and they won’t be featuring in our best watches under £500 either, but that’s not really who they cater for. If you’re after a nice looking watch that won’t break the watch, then that’s what they’re perfect for, they don’t have the best specifications but hopefully, that’s not really what you’re after. All in all, for the market that Armitron aim for, I’d say they are good watches. If you want an impressive business or dress style watch or even a rugged outdoor watch, then these likely aren’t for you. 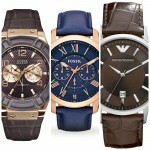 But if you need something for day to day wear in the office, or a sports watch for your weekend they are ideal. They’re suitable for the audience they’ve gone after and offer pretty fair value for money in my opinion. 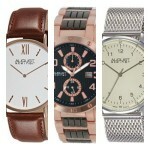 Below I’ve featured 5 of the top Armitron watches currently available. This is intended to give you a bit of an idea of what’s available from this brand. If you have any questions about the watches featured here just comment below and I’ll get back to you as soon as I can. First up in today’s Armitron watches review is this popular sports model. It’s a rectangular watch with a 32mm resin casing that has a thickness of 13mm. The strap has a perforated design and is made of resin also. It fastens with a buckle style clasp. 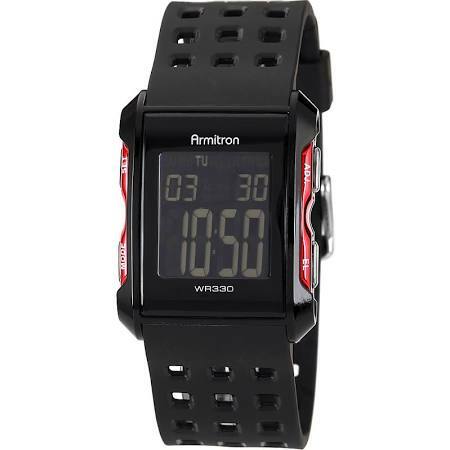 The LCD display is used to view and set features like the alarm, chronograph, lap, dual time, countdown timer and more. Powering this affordable men’s watch is a quartz movement for reliable and accurate timekeeping. Protecting the front of the watch is an acrylic lens that gives you a high level of shatter resistance. This model also has a 100m water resistance rating which is good to see. You can read my full 40/8177RED Armitron watches review here soon. 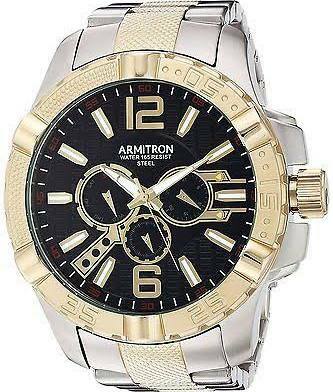 Up next we have this popular big face watch from Armitron. This is an oversized men’s watch with a 52mm stainless steel two tone casing that has a thickness of 14mm. The strap is also made of stainless steel and fastens with a fold over push button clasp. The dial features larger easy to read hour markers and hands as well as 3 smaller sub dials. These sub dials include a 24 hour display, date display, and day of the week display. Powering this men’s Armitron watch is a Japanese made quartz movement for reliable and accurate timekeeping. A mineral crystal glass has been specially hardened to give you a good level of scratch and shatter resistance. It also has a 50m water resistance rating. You can read my full 20/5209BKTT Armitron watch review here soon. Here we have a popular affordable Armitron dress watch with a stainless steel rectangular casing that has a diameter of 33mm and a thickness of 11mm. The strap of this timepiece is stainless steel plated and fastens with a fold over double push release clasp. 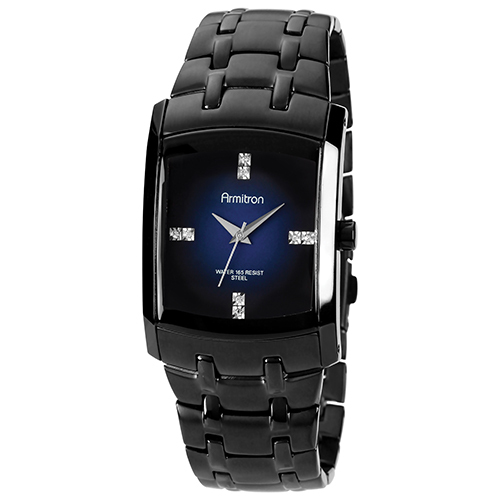 A key feature of this men’s Armitron watch is the set of Swarovski crystals that decorate the dial. They’ve used smart looking silver coloured hands that work really well with this blued dial. A Japanese quartz movement powers this watch giving it accurate and reliable timekeeping. Protecting the front of the timepiece is a mineral crystal glass for scratch and shatter resistance. The watch also has a 50m water resistance rating. You can read my full 20/4507DBTI Armitron review here soon. In at number four we have this stunning Armitron watch that’s built with a stainless steel casing that has a 42mm diameter and a thickness of 10mm. The strap is also made of stainless steel and fastens with a fold over push release clasp. I really like the deep blue colour of the dial and bezel on this model. The contrasting silver hands and hour markers stand out well making it very easy to read. There are 3 sub-dials which display a 24 hour timer, date, and day of the week. Powering this Armitron watch is a Japanese made quartz movement for reliable and accurate timekeeping. A mineral crystal glass lens is used for extra scratch and shatter resistance. The watch also has a 50m water resistance rating. You can read my full 20/4677BLSV Armitron watches reviews here soon. Last on today’s Armitron watch review is this skeleton style self-winding automatic timepiece. The Armitron watch is built with a stainless steel casing that has a diameter of 42mm with a thickness of 13mm. The strap is made of stainless steel and fastens with a fold over double push release clasp. 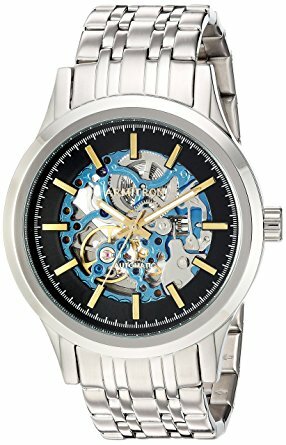 I’m a big fan of skeleton watches myself so I really like the design of this men’s Armitron watch. You can see a large part of the automatic movement working away and the golden coloured hands and hour markers actually stand out very well making the watch easy to read. Powering this watch is a self-winding automatic movement that’s powered up by the movement of your arm. You can also view the movement working away through the exhibition caseback on the rear of the watch. Protecting the front and rear is a mineral crystal lens which has been specially hardened for better scratch and shatter resistance. This Armitron skeleton watch has a 50m water resistance rating. You can read my full 20/5170BLSV Armitron automatic watch review here soon. Thanks for taking the time to read through today’s Armitron watches reviews. 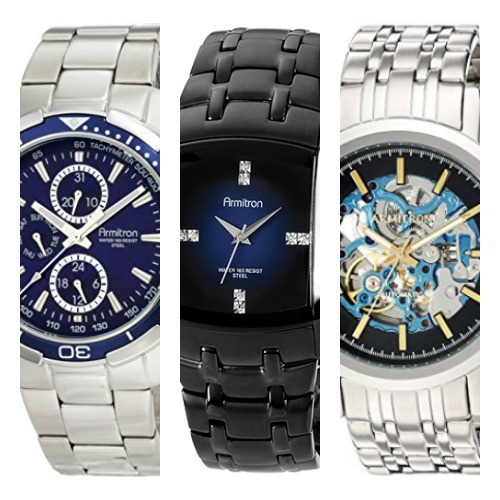 What was your favourite Armitron men’s watch? Comment below and let me know. An Armitron watches review eh? This brand reminds me of Guess watches, is anyone is getting that feeling?